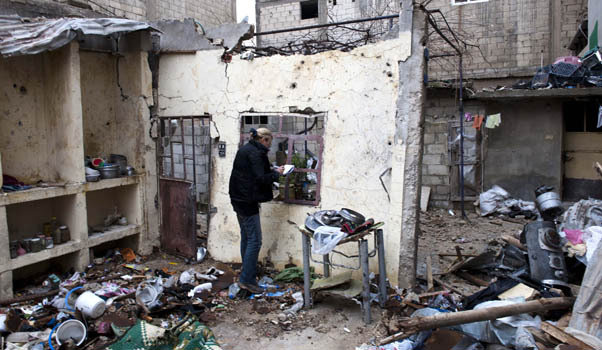 War reporter Marie Colvin in Homs. Homs, Syria is a long way from Oxford, England. If you are so inclined you can look at S.O.S footage on youtube of children with shrapnel wounds. This is much harsher than any imagery we have had from any previous conflict. There is no picture editor involved. The internet has changed the way we see war. So do we need journalists to go in there and risk their lives? Did Times correspondent Marie Colvin need to die last week? Does the sight of French journalist Edith Bouvier lying on a bed in a room with no electricity tell us more than the sight of a Syrian child lying dead? Can’t local people tell the story? To me the answer is obvious. Yes, we need the war reporters. They perform a task for all of us: bearing witness. That doesn’t mean we have to listen to the reports, but it’s important in the grand scheme of things that there are witnesses to history, people who are not involved in the conflict, who watch and listen and try to tell the truth. It may not even be important now but for posterity. There is nothing like an eye witness who is also an outsider. Who can forget Ed Murrow’s broadcasts from bombed London, once you’ve heard them of course? Local people and combatants have their story to tell, but a correspondent sees the world with fresh eyes. But what kind of person risks their life repeatedly like that? There must be a thrill of adrenalin, a love of risk, an ideal of truth-telling, an ability to tell a story – and above all courage. I looked at some charts to see if I could make connections. The choice was limited to whose birthdays I could find. There aren’t any birth times except for Martha Gellhorn’s. You’d expect contact between Mars, the planet of war, and Mercury, the planet of communications, at least. In fact none of the charts I looked at had a really tight connection between Mars and Mercury: clearly communicating about war is not the prime motivator. So what is going on? Unsurprisingly, this is a pretty hard-boiled bunch – a lot of Capricorn and Saturn there. You have to be persistent to get the story, I guess. 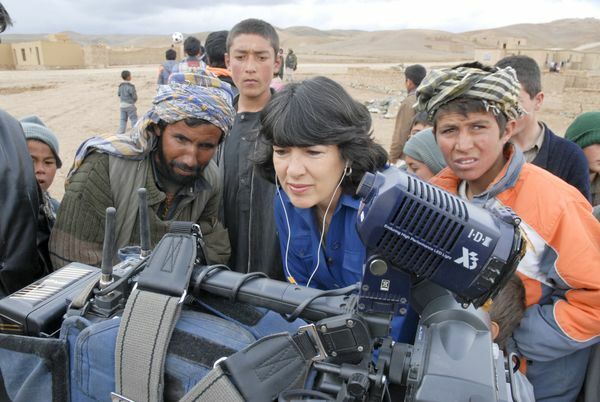 Christiane Amanpour, the CNN journalist, and Marie Colvin, were born on the same day, January 12, two years apart. That gives them both Sun in Capricorn, ruled by Saturn. They also both have a Saturn-Mars conjunction. Stamina-Courage = True Grit. 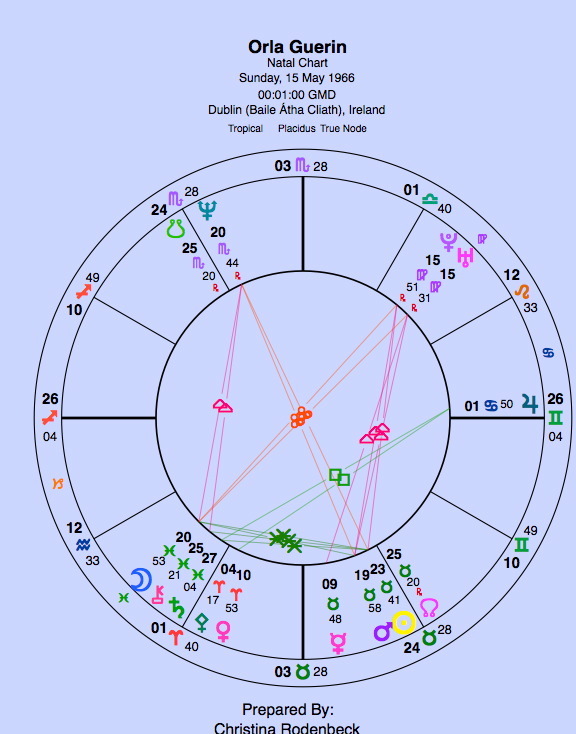 Taurean Orla Guerin, the veteran BBC correspondent, has Saturn conjunct her Moon and sextile her Sun-Mars conjunction. 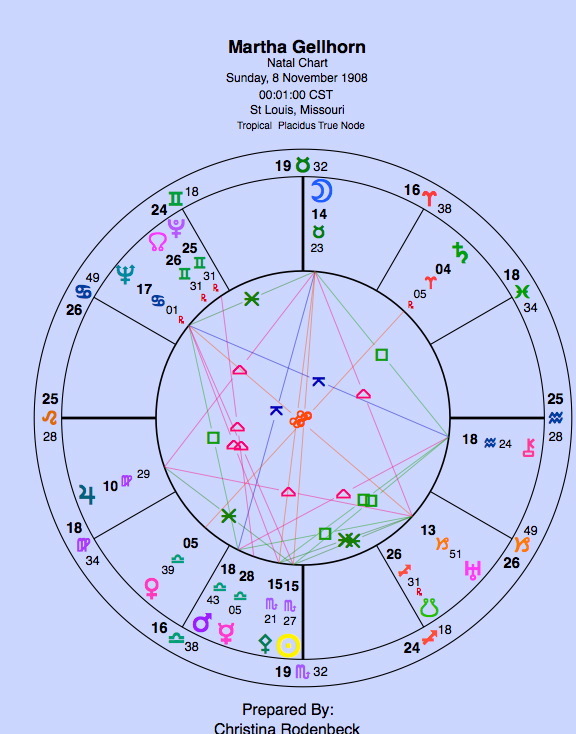 Kate Adie, who was shot in Tiananmen Square, has Saturn sextile her Virgo Sun but no Saturn-Mars contact. So far that is four earth Suns. 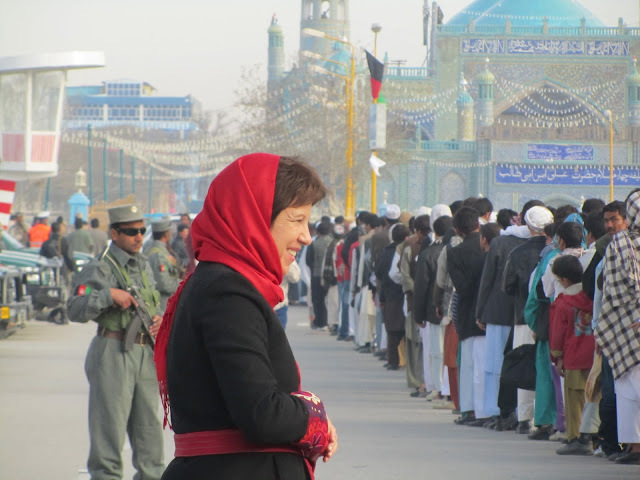 And there’s the Canadian Lyse Doucet, who also reports for the BBC from conflict zones: born December 24, Capricorn. War reporting would seem to require an essentially grounded, practical character. You may have noticed something about the correspondents I’ve found. They are all women. At first that was unintentional. Then I realised that the job of war correspondent is one at which women have excelled. We have yet to break the glass ceiling in the boardroom, but the split between men and women reporting war seems to be about 50/50. Shouldn’t the asteroid of the female warrior, Pallas Athena, feature in these charts then? Yes and she does. This is way stronger than Mercury-Mars: all orbs are tight. Maybe it’s less about a need to tell a story (Mercury) than a need to be there, being true to your own nature. There are other things to consider: glamour (Neptune) and stimulation (Uranus). 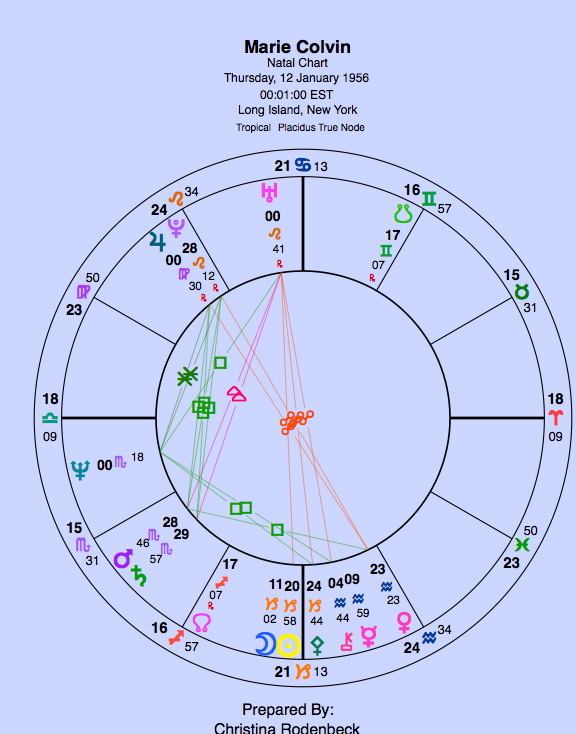 Take a look at how those two planets play out in each chart for yourself. But there’s one more point I dropped in that seemed important: the North Node, destiny. I felt that they started to come into focus. 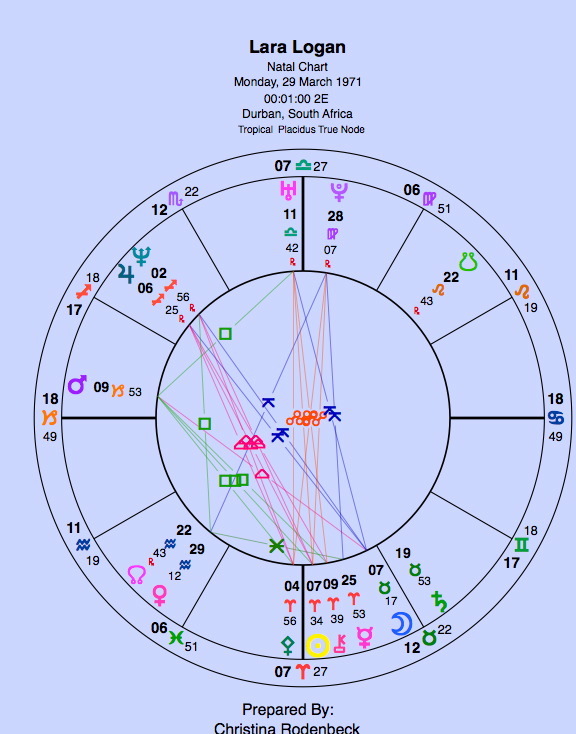 The least obvious North Node is Marie Colvin‘s but it does happen to be on the midpoint between Neptune (sacrifice) and Mercury (the story). And the most exact transit to her chart when she was killed Neptune, the god of sacrifice, at 0° Pisces exactly opposite her natal Jupiter in Virgo. Readers of this blog will know I believe that Jupiter comes when it’s time to go home. Certainly, for this week at least, her death has brought home to those of us safe in our houses, the horror for those people in Syria. Wow. Just wow. This is fascinating. Let no one say asteroids aren’t important. Apart from the superb analysis, may I suggest another point to consider – Vanth? Vanth, the moon for Orcus, is considered to be the one who guides the souls of those killed violently. Usually, these are murder victims, but I believe it also covers those killed in battle. Further, how about another she-warrior – Eris? It may not be as relevant, mind you, since Eris does involve sowing discord, in some sense. Still….. But yeah, Orcus might also be a good place to look, since where Orcus goes, Vanth MUST follow. I read this one slowly. I agree, war reporters are quite important. I’ve always admired them in many levels. @S Good point about Merc-Pluto. I’d have expected Merc-Pluto or Merc-Mars to be major signatures. This is fascinating! Thanks for doing this. I’m always interested in Pallas aspects (mine is strong, but has never given me much courage! I admire these women!). Interesting Mercury aspects look to be there, though not so tight. Guerin has Mercury trine Pluto and Uranus. Colvin has Mercury conjunct Chiron (maybe relating to her drive to communicate the wounds of war in ordinary people) and in Aquarius, allowing her some detachment in order to report. Adie’s is square Uranus. Logan’s is inconjunct Pluto. Gellhorn’s Mercury is trine Pluto (and NN). Amanpour’s is out of sign trine Pluto as well as sextile Jupiter. Overall, not as strong signatures as Pallas, but there. @Leslee – yeah, which makes me think the storytelling is there but not the driving force. Also the outer planets are very integrated in these charts, don’t you think, suggesting a real steer from the skies. Have you thoughts on the chart of the reporter, Anthony Shadid, b. 26 September, 1968, d, 16 February, 2012, in Syria? What an extraordinary chart – and yes he does have Pallas in the same degree as Mercury reporting. I will post the chart on my FB page for you to look at. 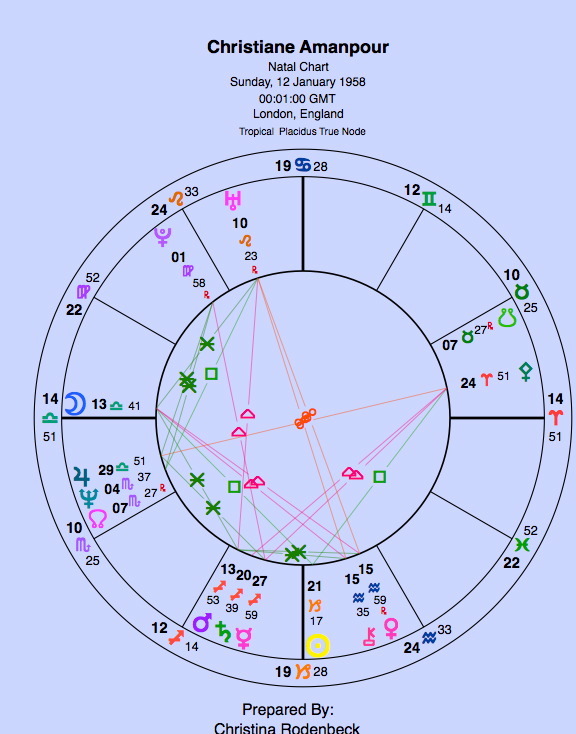 The outer planets are also stitched right in to his chart. People who have this tend to live out the spirit of their times more than others. He died with Saturn retrograde on his Venus-Mercury-Pallas conjunction. And Pluto squaring the nodes. “Wow” is right! The Pallas aspects are truly amazing for the women. I can sure understand the ability to endure (Saturn-Mars) too. The conditions war correspondents live in are often downright unpleasant, unsanitary and crude plus they are usually surrounded by wired militant types. Thanks and it is well researched article. I just found this post. It’s HUGELY interesting to me. I used to be a freelance foreign correspondent – not a war corry, exactly, nor would I ever choose to be one, but twice, I became one by accident. FTR, my birthday is Jan 14th. No Saturn-Mars conjunction but both are in Capricorn. Mars is on my DC at 0 Cap, Saturn exactly (to the minute) conjunct my POF at 11 Cap. Saturn is also conjunct Mercury (15 Cap) and Ceres (14 Cap). All in all I have 5 Cap planets, plus my DC and POF. 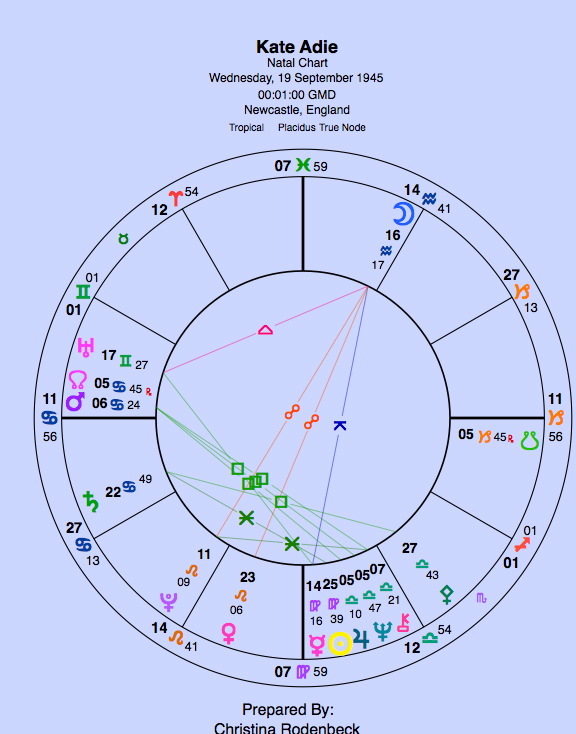 I had to check on Pallas, and that was interesting – 27 Sag, conjunct Mars, close to the DC and Jupiter (21 Sag) – close to exactly sextile my MC and square my nodes. Again – you are definitely not flaky! Interesting about the Pallas-Mars conjunction on DC. Fits with war coming to you, like a partner…. I am part way through a book of Martha Gellhorn’s letters over her lifetime. She mentions visiting her astrologer in Rome who gave her helpful information about a Saturn transit ending (no further details, maddingly!). From her pictures I guessed she was Leo rising from the little “mane’ hairline and her colouring. A small thrill to see I got it right. Her fortitude and courage were undisputed but what stands out in the letters is how wedded she was to her work ethic and loved to be alone . (Emotional vulnerability, difficulty is showing much ardor and showing gratitude) She developed her self-confidence slowly, with much effort, battling a natal retrograde Satun until age 30, when sit turned Direct. After that age, she seems to settle “into her own skin” more comfortably. My reading is at the point where she decides to marry Hemingway. Thanks so much for comparing the charts of these amazing, courageous women who chose to be in the think of war as correspondents. I thought I would find more Aquarian Moons and noting a Pisces one was interesting. Takes all sorts. The Nodes tell a big story when aligned with planets and look forward to studing the charts in more depth. I forgot to include the reference of Venus opposition Saturn before my mention of her vulnerability etc. Thank you for those comments Lynne. Wish she’d said more about her Roman astrologer! Must get Martha Gellhorn book. Gilly’s comment is helpful as I’ve got Pallas in sag too, nearly on DC at 23 degrees and exactly conjunct my south node. Your reply on that was helpful. I’ve been struggling to figure this out. Great read all around as usual.